Each stage of Tirana’s architecture has been marked by the history of this city, by each leader of the country, the influence of nations across the Adriatic and Ionian, and not least by the ambition of the architects who left their traces in post-World War II Tirana. Today, Tirana represents a uniquely fascinating social and historical destination. The traces of the past are concrete stops along this tour which contains tangible objects that keep one’s senses in tune with history. One such object, one of the architectural treasures from the last years of communism, is located along the main boulevard. The Pyramid, the undisputed top attraction for every visitor, was designed by the most talented group of architects of the time to be the mausoleum of Albania’s former dictator, Enver Hoxha. Until 1991, its main function was as Hoxha’s memorial while, after 1991, it was converted into a cultural center. An aerial view of the Pyramid reveals not only the fact that its shape is not of a standard pyramid, but also the shape of a two-headed eagle, the Albanian symbol that is also embroidered on the national flag. In recent years, the building is due to be renovated and partly reconstructed with the objective of returning its architectural functions to the public’s service. 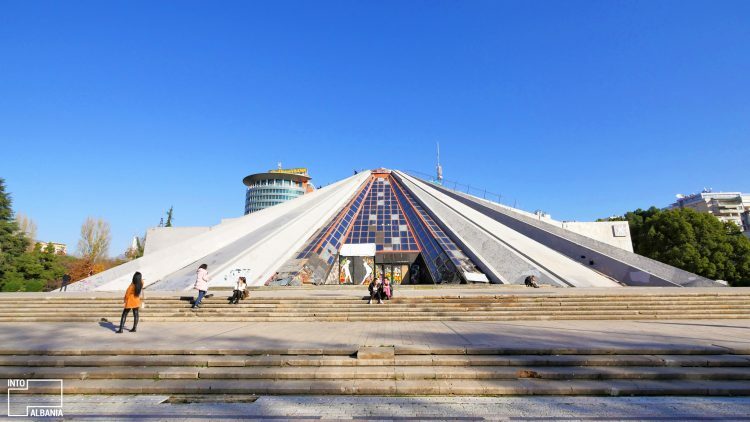 The Pyramid is a permanent presence in every memory of the city of Tirana. You are always sure to find teens climbing up and down the sloping sides of this landmark! Read our detailed article here. 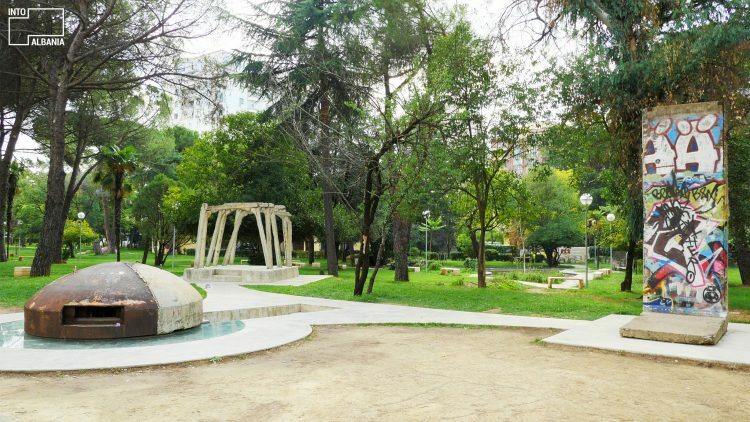 The area of the former Block is one of the most fascinating and dynamic quadrants of Tirana. The unexpected combination of the modern urban and the inherited architectures visually told, after the 90s, the city’s communist history and what followed thereafter. 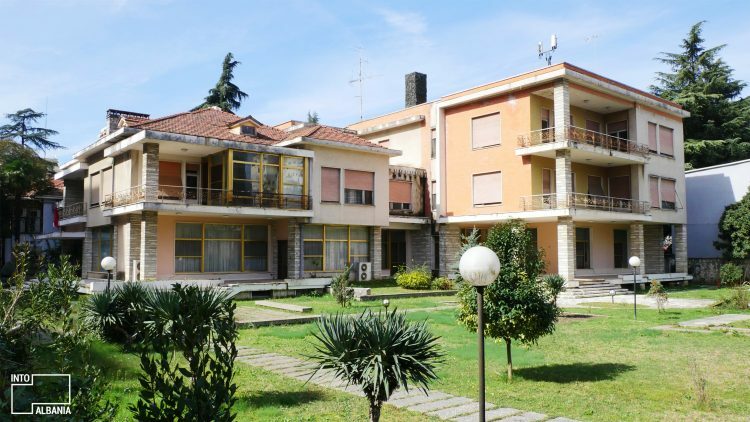 During Communism, the entire Block area was forbidden to ordinary citizens, who were supposedly too afraid to turn their heads and look at Hoxha’s villa from afar. Enver Hoxha’s Villa was built in the center of this quadrant on a large piece of land surrounded by a light iron fence. 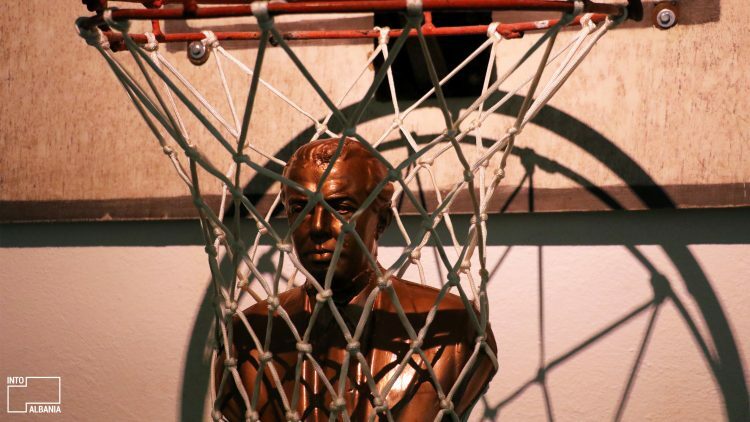 Hoxha lived in this villa until the last hours of his life, leaving behind the population’s permanent curiosity on what exactly happened inside the place where Albania’s most powerful man for more than four decades organized his life. Built after the 1960s, the older part of the building mimics 1930s architecture while the new part is a massive concrete block, covered with white stone tiles, making the villa look like both a residence and a fortified structure. 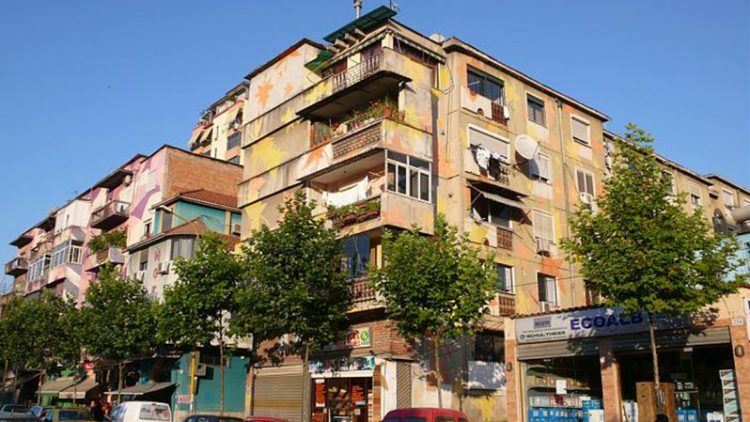 The house has remained exactly as Hoxha’s family left it! No more than 120 meters from Enver Hoxha’s villa toward the Boulevard “Zogu I”, on the right side of the street you will find a monument called the Post-Block Memorial, a testimony to human resistance during the dictatorship in Albania. It could not be otherwise as one of the co-authors of the memorial is Fatos Lubonja, a publicist who was put in the most infamous communist prison, that of Spaç. The installation is built in three connected parts: a fragment of the Berlin Wall, an original Communist bunker, which guarded the main entrance to the former Block, and several iron columns taken from the notorious Spaç mine, where many opponents of the communist regime were imprisoned. Read our detailed article here. The “House of Leaves” represents Albania’s attempt at building a sincere relationship with its past. Initially intended for health services, during WWII, this enigmatic building was used by the Gestapo and afterword converted into the headquarters of Albania’s former State Security (Sigurimi i Shtetit) where the sophisticated tapping of the capital’s population took place. The proximity of the building to the Central Post Office was no coincidence as this facilitated the interception of the people’s correspondence. The building is easily accessible from any point in Tirana, located only a few meters from Skanderbeg Square, opposite the Orthodox Cathedral. Read our detailed article here. Before the 90s, for the majority of Albanians, information represented a luxury. For the most part, it was entirely absent and, even when provided, it was carefully selected and manipulated to keep the population under control. This category of fiercely guarded governmental secrets included the construction of the anti-nuclear bunker, inaugurated in 1978 by Enver Hoxha with one specific aim in mind: the protection of communist officials from a potential attack by foreign armies, an attack which never happened. This 5-story underground palace, built in Tirana’s northeastern entrance, includes 106 rooms and a large conferential hall. 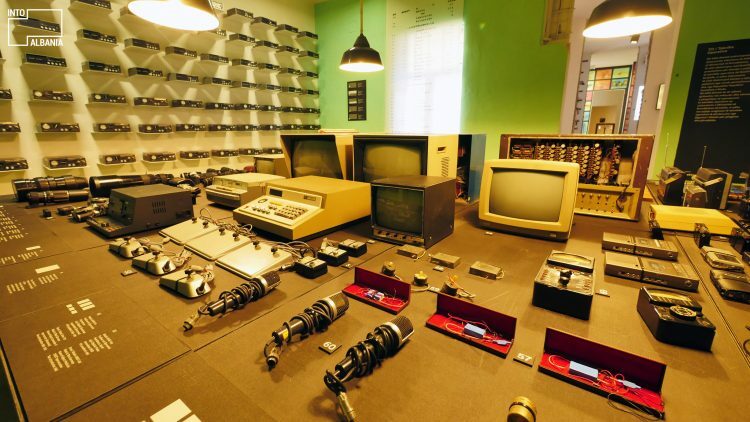 A number of the rooms exhibit aspects of Hoxha’s life through photos while others display the original furnishing belonging to the period of dictatorship. 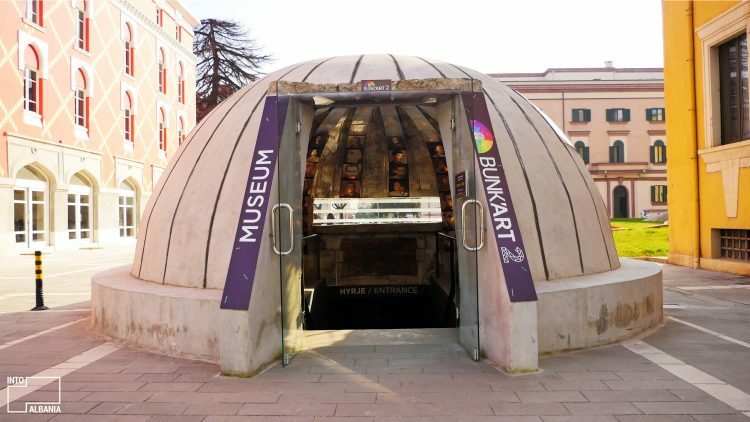 Presently, Bunk’art 1 is one of the most interesting and emotionally-stirring destinations for tourists. Read our detailed article here. The bunker located behind the Ministry of Internal Affairs is a similar structure albeit smaller in size. Photos of the period’s documents show the relationship between the dictatorship and its guiding ideological principles. Bunk’art 2 reconstructs the history of the Albanian Ministry of Foreign Affairs during 1912-1991 and reveals the secrets of the former State Security, the secret police that persecuted the opponents of Enver Hoxha’s regime. The bunker has 24 rooms and a special apartment for the Interior Minister. This well-calculated maze, all built in concrete, was meant to protect in case of possible chemical attacks, which also never happened. Read our detailed article here. The so-called prefabricated residential buildings are dispersed around the entire capital. Homes to a majority of the Albanian population during communism, these buildings are a symbol of the mostly unattractive communist-era architecture. While they are strikingly similar to other Eastern European communist-era constructions, they still retain a recognizable Albanian style. Many of these facades were painted in bright colors and varying patterns at different periods in time, transforming something grey and mass-produced into something bright and unique and giving the city a much-needed makeover. The eastern entrance to the capital is marked by one of the most significant objects of national memory: The Cemetery of the Fallen Heroes of War and the “Mother Albania” Monument. Built on a hilltop, this monumental complex holds the remains of 900 partisans and is visible to any traveler entering or exiting Tirana. 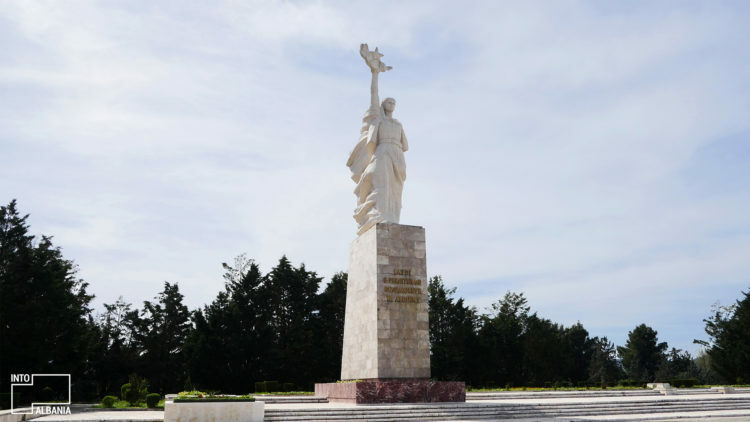 The iconic monument made of concrete and 12 meters in height, portrays Albania as a woman holding a laurel wreath and a star on each hand. On the 3 meter high pedestal, the words “Everlasting glory to the martyrs of the nation” are carved. This cemetery once held the body of former dictator Enver Hoxha, later moved to one of the city’s public cemeteries after the fall of the regime in 1992.